There should be no reason your loved one is denied the very basic care needed to prevent a pressure ulcer while under the care of a nursing facility and the progression of a sore into later stages is a definitive sign of negligent treatment. The Rockville bedsore injury attorneys of Nursing Home Law Center LLC are leading advocates for the rights of those who have been injured through the failure of their caregivers to provide the very care they were promised. If a care center is unable to implement treatment plans tailored to the specific needs of its clients, then changes need to be made that would ensure the manpower and resources are provided to allow caregivers to do their jobs. The city of Rockville is growing quickly, becoming the third largest city in the state after reaching a population of almost 67,000. It is also a haven for senior citizens, which represent over 14% of the populace— a proportion that is higher than the state and national averages. With such a significant senior population, it is important that quality programs are in place to serve the needs of the aging. Seniors can enjoy access to numerous programs and services through the Rockville Senior Center, which offers a modern fitness center, exercise and wellness classes, daily lunches, recreational events, group outings and special events. Members can also take up new hobbies or learn new skills with access to a woodworking shop, computer lab, garden, library and lounge. To learn more, you can visit http://www.rockvillemd.gov/index.aspx?NID=397. While there are 87 nursing centers serving the Rockville area, not all of them deliver the same quality of care. Medicare routinely rates homes based on their staff to patient ratio, health inspection histories, quality control measures and other critical factors and publishes this information through its nursing home compare tool. Our Rockville pressure sore lawyers believe that this is an indispensable tool for those who are considering placing a loved one into a nursing facility. In addition to allowing you to compare homes side by side, the tool will let you know if a facility accepts Medicare or Medicare payments and can meet the special needs or requirements you or your loved one has. You can also eliminate homes from your search that have been fined or denied federal payments due to neglect or negligence in the past. 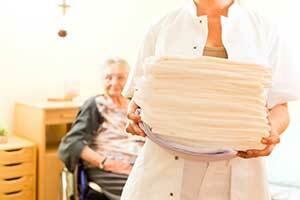 There is no secret formula to preventing and treating bedsores that some nursing homes have which others lack. It comes down to the ability of staff members to check in with their patients every several hours and change their positions so that circulation is not restricted to areas around the joints. We consider these measures as quite simple and within the realm of what can be reasonably expected from any nursing patient. The reason pressure ulcer cases are becoming so prominent in the news is many for profit nursing companies are not hiring enough staff members to properly care for all of their residents. When understaffing has made it impossible for caregivers to provide very basic care, a line has been crossed in the endeavor to place profits above people and we refuse to tolerate this injustice. We fight on behalf of our clients to send a clear and loud message that any nursing home guilty of disregarding their patients’ rights on this level will suffer serious legal and financial consequences. Nursing Home Law Center LLC has the experience, knowledge and resources needed to give you the best chance of winning or negotiating a settlement for your claim. We’ve helped thousands of victims secure the damages they needed to move forward after being injured due to neglect and would like to invite you to learn more about how we can help you do the same. Contact us today to arrange a free case evaluation with an award winning Rockville bedsore injury attorney. Should you have questions about Maryland law related to pressure sores, view our page here.